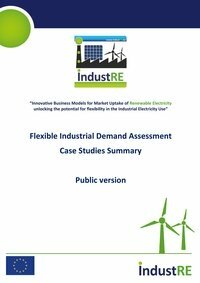 The report summarizes the results of demand response audits (DRA) at the premises of different energy intensive companies in various European countries for various business models. A demand response audit (DRA) is a generic approach for identifying, evaluating, and exploitation of flexibility in a flexible industrial demand (FID). It can be used either for exploitation purposes of existing flexibility in the process, or during the process upgrade to make it more flexible (“design for flexibility”). 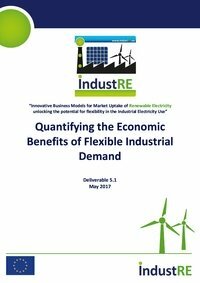 This report quantifies the economic benefits that flexible industrial demand (FID) can bring in the European context. 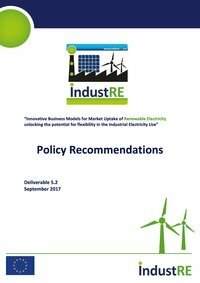 The first part of the report looks at the economic benefits from the perspective of the whole power system (i.e. the societal perspective). The second part of the report assesses the economic benefits from the perspective of a single flexible industrial consumer. IndustRE has selected 6 potential case study candidates covering 5 countries and 4 industry sectors on which the methodology for optimal valorization of flexible industrial demand will be applied. This document provides an overview on the selection process of the candidates. Bilateral agreements for the supply of variable renewable electricity to industrial users with flexible demand. Two of the business models identified by the IndustRE project in the report “Business Models and Market Barriers” for reaping the benefits of flexible industrial demand, directly involve industrial electricity users and variable energy producers. This report, as an “implementation tool” to facilitate the adoption of those business models, sets the foundations for developing bilateral contracts, which can be used by the involved parties in order to sort out their mutual relations both in case there is on-site and off-site variable renewable energy generation. This report relies on the previous IndustRE analysis of the regulatory context in the target countries and the business models that were identified. In doing so it goes a step further by a) looking at the local regulatory context for flexible demand b) defining the most suitable business models in relation to electricity market design and actors in target countries c) investigating the flexibility potentials in the countries and d) looking if and how a price for flexible demand in the target countries can be assigned. Finally this information is brought together to define specific business models. Besides this a methodology for their calculation is specified.